This sprawling Craftsman exterior is unified by arches over the windows, garage doors, and the front porch entry. With a spacious gourmet kitchen with island, flexible dining space, and generous great room, The Atticus is designed for entertaining and togetherness. Rear porches and a patio facilitate outdoor living when the weather is nice and allows continued use in cooler months with an outdoor fireplace. The thoughtful master suite comfortably accommodates two, with dual sinks and a divided closet. 1st Floor: 2347 Sq. Ft. 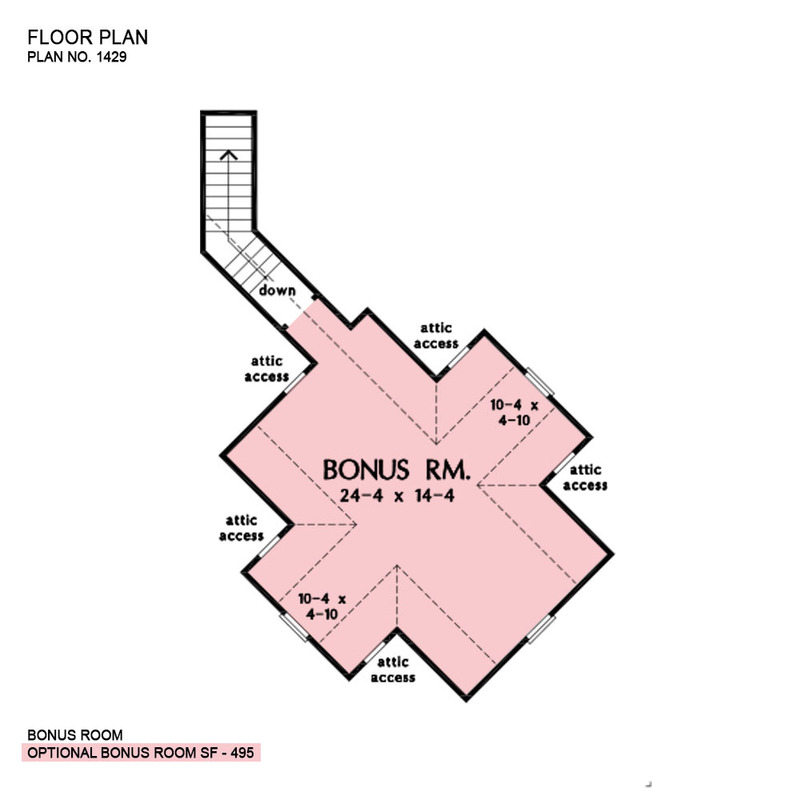 Bonus Room: 493 Sq. Ft.
Porch - Front: 223 Sq. Ft.
Porch - Rear: 208 Sq. 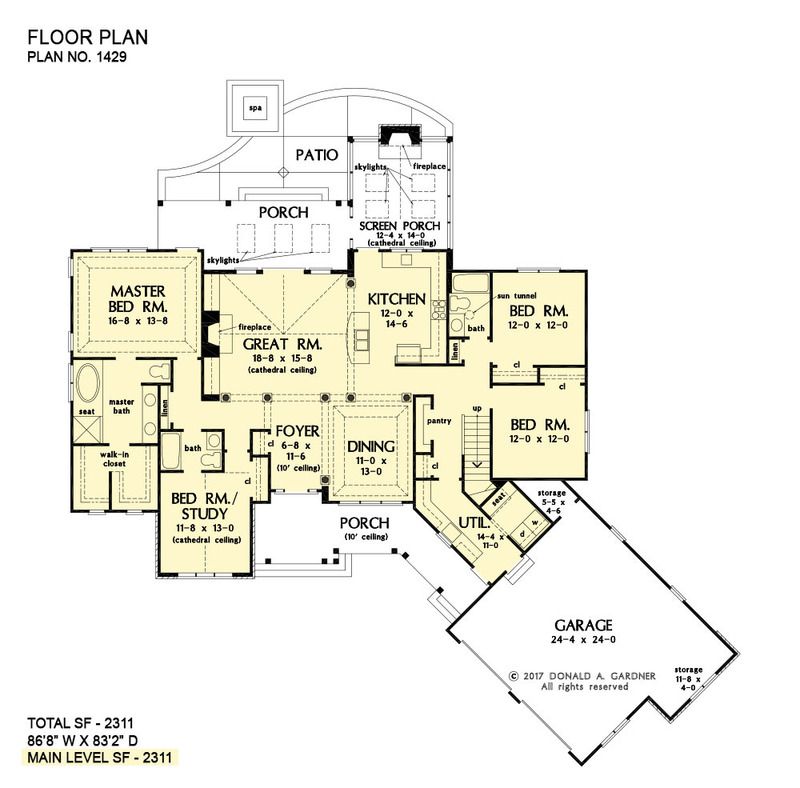 Ft.
House Dimensions: 86' 8" x 83' 2"
Garage Storage (Flat): 5' 5" x 4' 6" x 0' 0"
Foyer (Flat): 6' 8" x 11' 6" x 10' 6"
Great Room (Cathedral): 18' 8" x 15' 8" x 18' 4"
Kitchen (Flat): 12' 0" x 14' 6" x 9' 0"
Utility Room (Flat): 14' 4" x 11' 0" x 9' 0"
Bonus Room (Clipped): 24' 4" x 14' 4" x 8' 6"
Garage (Flat): 24' 4" x 24' 0" x 0' 0"
Garage Storage Bay (Flat): 4' 0" x 11' 8" x 0' 0"
Bedroom / Study (Cathedral): 11' 8" x 13' 0" x 13' 0"
Porch - Front (Flat): 11' 2" x 7' 10" x 10' 0"
Porch - Rear (Flat): 18' 8" x 9' 0" x 9' 0"
Deck / Patio (None): 38' 4" x 14' 8" x 0' 0"
Porch - Screen (Cathedral): 12' 4" x 14' 0" x 14' 0"